Tagged under Kazuma Kaneko, Atlus, TMS Entertainment, Series, Megami Tensei, Games. Overall rating- 5 A Must Have Game! Remember, these are ratings based on my opinion and is bias. You should make your own conclusions. If you have further questions or requests - screenshots, images, plot- regarding the game, you may go ahead and message. 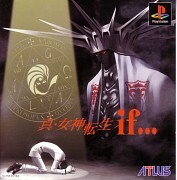 No feedback on Shin Megami Tensei.